Just this morning I was contemplating how horrible it must be for the people who suddenly lost their homes in the fire around Lake Tahoe. 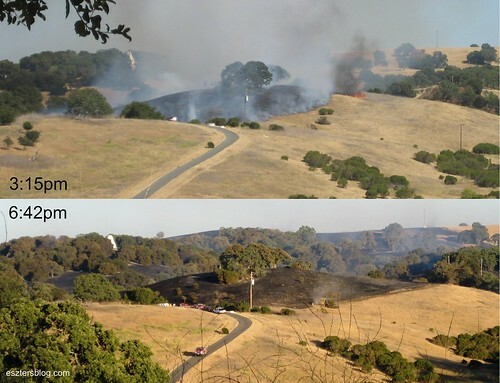 By the afternoon I was watching firefighters from my office window battle flames on Stanford’s hills. I was sitting at my desk already unable to work having just received word about the death of Peter Marris, Professor Emeritus of Urban Planning at UCLA, dear husband of Dolores Hayden who was a fellow Fellow at CASBS this year. The two of them had to end their year at the Center early, because Peter was sick, but I don’t think any of us expected things to escalate so quickly. Unable to concentrate on work, I turned around to look at the beautiful view from my office. I spotted some big red flames. Soon I realized that a large area around it was completely black with smoke and flames on the periphery. Eventually sirens and helicopter appeared, as did firefighters. Some of the smoke was now white not just black, apparently a good sign. But not all the black smoke disappeared and an hour later there was still much activity. I went to an event and by the time I got back to my office, another hillside was completely black (see the difference in the left area of the two photos above). This entry was posted on Monday, June 25th, 2007 at 10:41 pm	and is filed under Friends & Family, Life in Palo Alto, Palo Alto, People, Photos. You can follow any responses to this entry through the RSS 2.0 feed. Both comments and pings are currently closed.